A few weeks back, we visited the Vancouver sets of Arrow and were able to speak with members of the show’s cast and crew. 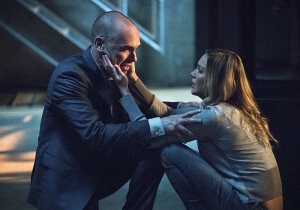 One of the highlights, of course, was getting to speak with the talented Paul Blackthorne, whose Quentin is going through quite a lot this year, what with his daughter coming back from the dead and all. Blackthorne answered many questions — including whether or not he’s going to make the call to his ex-wife Dinah to tell her that they are back to having two daughters again. “Dinah who? Dinah what?” he joked when asked about the ex. “Oh, her! She’s living with Jeffrey now. Jeffrey? Who’s Jeffrey? So I don’t think about her anymore. Lance has banished these thoughts. He’s finally over that estranged relationship,” Blackthorne stated before giving a more serious answer. “It’d be lovely to see her back, of course, because it’s Alex Kingston and she’s fabulous, but no. I think Quentin has finally expunged all thoughts of Dinah and any potential future with her for his own sake, really,” he said. After discussing the women of Quentin’s past and present, there might be another woman in Quentin’s future, as well. Charlotte Ross is guest starring in multiple episodes as Donna Smoak, and when asked about the episode currently filming, Blackthorne made a comment about having lipstick on his cheek. Could “SmoaknLance” become a thing? 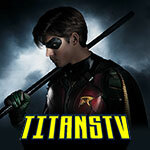 We’ll have to stay tuned… we will also have to stay tuned to find out if it is Quentin Lance in the grave that was teased at the end of the Season 4 premiere. “One has to be philosophical about these things, if you’re an actor on a TV show and you see various characters dying each year, you think ‘is it going to be mine these years?’ I just say that it’s four years in, can’t complain, very happy, take one season at a time, and if you’re propping up the daisies at the end of it, then so be it, but hopefully not. It’d be nice to keep going. It’s a nice show to work on,” he said. 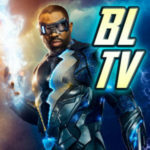 You can watch video of the entire interview below, where Blackthorne discusses working opposite Neal McDonough and his character Damien Darhk, Oliver’s run for Mayor, and more. Enjoy! 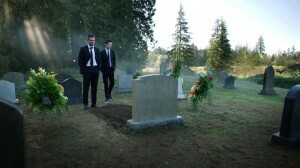 Arrow has another new episode coming this Wednesday, November 4 on The CW.